I don’t know about y’all, but when I think about rice pilaf, there is always an air of mystery. But when you look up what a rice pilaf actually is, it’s basically some rice with some other stuff in it. It’s usually some wild rice, but it could be some toasted onion, spices, raisins, nuts, etc. Tah-Dah! Mystery solved. Of course, some are more complicated where you toast the pre-cooked rice in some butter with some vegetables and spices, then cook everything in some broth or some saffron water. This recipe is much simpler. Pilaf can be traced back to the Middle East to about 2500 years ago. Historians have found that the dish was probably served to Alexander the Great and Darius the Great. It has spread to become a very international dish. But if you think about it, paella or risotto could be considered a pilaf. Even fried rice could fall into that category. Now I don’t really know how to quantify some ingredients since some leftovers were used and everything was thrown together. I had some beets leftover from some other dish that I didn’t end up doing (I had originally planned that Mixed Green Salad with Chive Flowers and Fried Goat Cheese to also have Roasted Beets. But it seemed too busy so I nixed the beets.) Plus, there was some leftover brown rice in the fridge with which I needed to do something. So this is my first real attempt to “standardize” the recipe. 1. 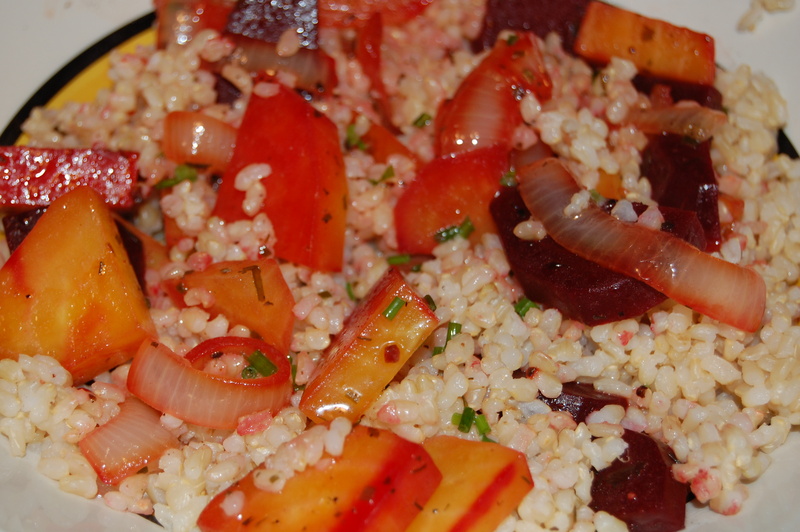 On a large sheet of foil, place the beets, onion, and herbes de Provence. Drizzle with the olive oil and toss gently. Add the salt & pepper. Fold half of the foil sheet over and crimp the edges to seal them and make a pouch. 2. 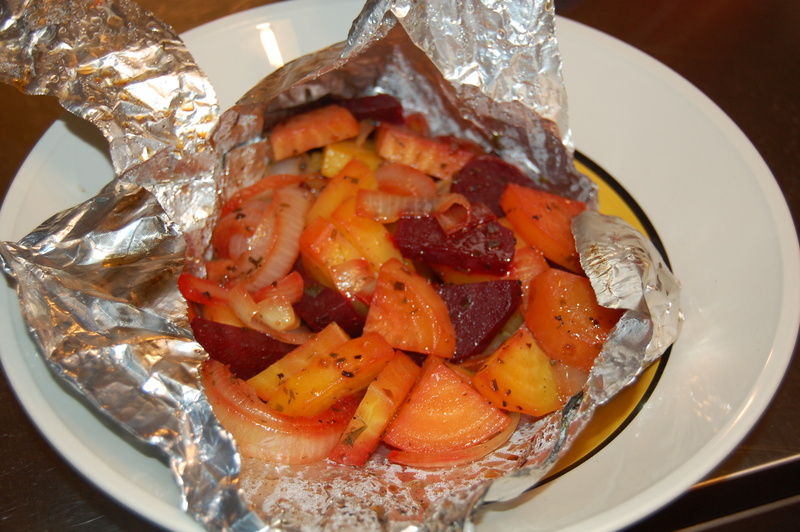 Place the foil pouch on the grill and cook for 25 – 30 minutes, until the beets are tender. 3. Transfer the cooked rice into a serving dish. Empty the contents of the foil pouch on top of the rice and toss to combine. Top with the chive butter. 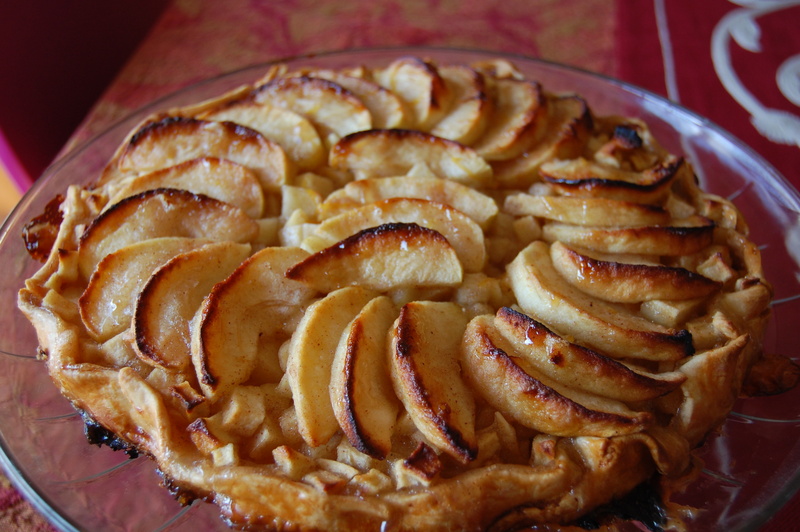 Note — If you are making this for someone who’s vegan, just omit the butter. Plus you can still cook this on the grill with some burgers and hot dogs and the like along with the beets because they are self-contained. Since they are in a foil pouch, the beets are protected from the meat. Of course, there are some who might object to using the same cooking surface regardless. You could always get a second grill! This entry was posted in Culture, Recipe, Sides and Appetizers, Vegetarian and tagged Culture, Food, Recipes, Sides and Appetizers, Vegetarian.